Maker’s Mark has been making good bourbon since 1954, but to say the company rarely comes out with a new offering is an understatement. In fact, the only time Maker’s ever expanded its standard U.S. offerings was the Maker’s Mark 46 in 2010 (if you don’t include their brief announcement in 2013 to reduce proof from 90 to 84, which was soon retracted after consumers rebelled). Perhaps it was seeing this outrage that made Maker’s Mark decide to introduce a new cask-strength offering. A more cynical drinker would suggest lowering the proof was a brilliant marketing ploy designed to stoke demand and pave the road for a premium-priced, limited, cask-strength edition. Whatever the reason, Maker’s began selling the cask-strength bourbon in its distillery gift shop earlier this year for $45 per 375 ml. bottle, which is half the standard size. The cask-strength bottles are now being distributed more widely, and I recently bought one at a shop in New York City for $40. Maker’s Mark Cask Strength is bottled at 113.2-proof, which while hardly lightweight isn’t actually all that high for a cask-strength offering (my bourbon shelf currently has at a half-dozen open bottles that are at least 120-proof). Recall that Maker’s Mark is that it is a wheated bourbon, as in wheat, not rye, is the secondary grain, which generally means a sweeter profile. While wheated bourbons are a minority, they make up many well-known bourbons including Pappy, Weller, Larceny, and Old Fitzgerald. The cask-strength Maker’s Mark offering has deep caramel color. The nose is more muted than you might expect from a cask-strength offering, but it still has quite a bit of honey, cherry, and clove notes. It really shows its colors on the palate. There you start to get the intensity of this whisky (as Maker’s spells it). It features a lush combination of vanilla, caramel, and cinnamon. There are some roasted nut notes, and a hint of dried fruit. The finish is long with loads of spice and thick caramel. Maker’s Mark has something of a reputation as a beginner’s bourbon, but this cask-strength offering blows that reputation away. It’s the perfect pairing for a maduro cigar, wither a Broadleaf-wrapped smoke like the Liga Priavada or a Mexican-wrapped cigar like La Aroma de Cuba Mi Amor or Dante. While the price is high ($80 when extrapolated out for a 750 ml. 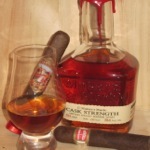 bottle) the Maker’s Mark Cask Strength is still a tasty new addition to the ever-expanding bourbon landscape. 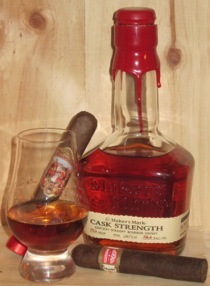 I’d recommend it to two types of bourbon drinkers in particular: First, fans of cask-strength bourbon will want to pick this one up; second, if you’re a fan of Maker’s Mark (and Maker’s 46) and looking to expand your bourbon horizons, this cask-strength offering is the perfect vehicle for doing so.